According to Dictionary.com, gaslighting is “to cause (a person) to doubt his or her sanity through the use of psychological manipulation” ( retrieved 8/19/2016 from http://www.dictionary.com/browse/gaslight?s=t). Believe it or not the first documentation or official recognition of gaslighting occurred in the form of a play in 1938 titled, “Gas Light“. A movie followed in 1944 starring Ingrid Bergman and Charles Boyer and highlighted the spousal abuse by the husband’s manipulations to make his wife think she is crazy. Gaslighting is a thing, or a verb to be literal. It is an action or manipulation by one person of another, or even several. Gaslighting is not just a characteristic of abusive relationships, but is a tactic used in organizations by individuals also! The specific culture of an organization and its leaders can also add fuel to the fire. More specifically it is a tool used in discrimination, sexual harassment, and retaliation towards employees. How do I know? It happened to me. It not only happened to me, it happened to many other women that worked in Law Enforcement at the same police department. It continues to be a tool used across the country by police departments who have negative organizational cultures towards women and minorities and any other individuals that tend to be abused and devalued. It is used to negate or reduce their own responsibility (legally and financially) for how they treat their employees. If legal remedies are sought by the victims of discrimination or sexual harassment it can be even worse. Here’s how it works. It is based upon the continuance of inequality to maintain the status quo of privilege. When an employee complains, let’s say a female police officer complains about a coworker sexually assaulting her (true story, but not my experience). This could look like CSC 1, 2, 3, or 4. For more details look at Michigan Compiled Laws or MCL 750.520a, b, c, d…what this means is there are levels of seriousness. Sexual contact or touching (grabs bottom or breasts over clothing), sexual assault (sticking hands inside clothing), using force, coercion from a person in a position of power such as a supervisor or boss or someone in some sort of authority position…(“If you want to keep your job…, pass your probation…, if you want to ever get a job again…). In Law Enforcement it is easy to get rid of an employee complains, especially if you have the department psychologist in your hip pocket. In my department women who were sent for Fitness For Duty Evaluations, had typically complained about something that was criminal, unfair, discriminatory etc. There was not usually a “precipitating event”. All the women in my department that were sent to the police department’s psychologist after complaining or sticking up for themselves, LOST THEIR JOBS. Male officers who had criminal, domestic, or very serious issues, were sent to the Police Psychologist, given a suspension sometimes, and allowed to go back to work after their “punishment.” The majority of them DID NOT LOSE THEIR JOBS! Gaslighting occurs at the workplace in the form of bullies unscheduling things you scheduled, misplacing files and other items that you are working on and co-workers micro-managing you and being particularly critical of what you do and keeping it under their surveillance. They are watching you too much, implying or blatantly saying that you are doing things wrong when, in fact you are not. As you can see, this is a competitive maneuver, a way of making you look bad so that they look good; and it is a way of controlling you. It is coercion through manipulation, so it is violent and meant to make you be overly careful and worried about what you do instead of seeing what they are doing. In the end they will push you out of the job entirely. they will get allies to do this in a technique known as mobbing. Mobbing is harassment and abuse committed on one person by a group. There have also been a large number of books written about gaslighting. The reason I am writing about this, is because we all want to be successful in work, in relationships, etc. Gaslighters are abusive and you can stop them. But you have to realize that you are being gaslighted in the first place. This takes recognition of your self worth, that you are not crazy, and that you are being targeted and manipulated. (I don’t have the entire list just the highlights here). *Discrediting you by making other people think that you’re crazy, irrational or unstable…..
*Twisting and reframing. When a gaslighter confidently and subtly twists and reframes what was said or done in their favour, they cause you to second-guess yourself–especially when paired with fake compassion, making you feel as though you are “unstable,” “irrational,” and so forth. Back in the day, when people didn’t want to pay attention to a woman–or were generally disturbed by her behavior–she was taken to a doctor and diagnosed with hysteria. Hysteria was a catchall diagnosis for women who were feeling nervous, irritable, too horney, not horney enough, “causing trouble,” or were suffering from a wide variety of other ailments thought to be caused by female biology. The word actually came from the Greek “Hystera,” which literally means uterus. So, in short the problem of having hysteria really meant the problem of being a woman. I read a book that kind of encompassed what many women went through in Victorian times. Now there are laws against this type of behavior, but it is still happening in more subtle ways…I highly recommend it. The Painted Bridge by Wendy Wallace. Most people who need security solutions experience sticker shock when they check into having a home security system installed. Recently, I was told about a situation where several neighbors on one street were surprised by a man going from back yard to back yard. When one resident came face to face with the individual, the back yard interloper simply walked away down the street, nonchalantly. It was 10am. All the neighbors had called each other down the street. It appeared to them that the individual was checking back doors/yards for houses that were unoccupied, unlocked. The hindrance was that everyone was home, mostly retirees. This incident was scary, and fortunately nothing happened. There were too many witnesses, and the police were called. There had also recently been daytime break-ins. When this type of thing happens there are many things that can be done to discourage a break-in, day or night. First, get to know your neighbors. There’s nothing better than a nosy neighbor, or a trusted one that you know will watch out for you. Secondly, do not make it easy for them. Lock your doors. 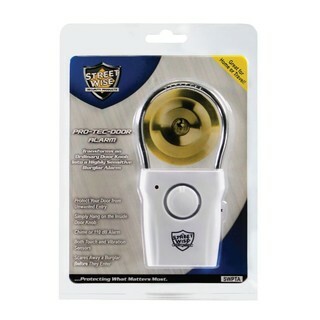 Get motion sensor lights for outdoors. You can buy fixtures and sensors at most of your local hardware stores, Lowe’s, Home Depot and the like. Most are easy enough to install yourself. If not hire an electrician to do it. This should not cost a lot (shop around). Burglars do not like light or noise. Set a large dog bowl by the back door that says “Brutus”, or a very large pair of men’s boots will also deter someone (make sure they look used, dirty!). 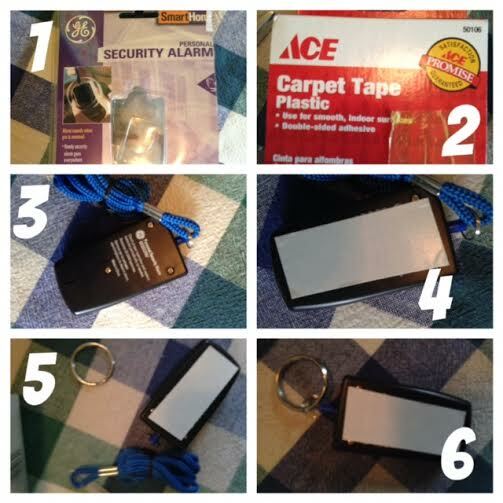 If you are worried and can not afford to put in an expensive security system…there are some inexpensive things you can do. There are a lot of personal alarms that come in many shapes and sizes that can be used in a variety of ways. 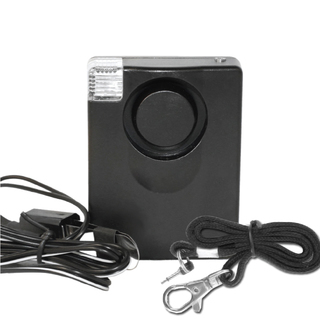 You can find these at Radio Shack, some hardware stores, and online at Amazon, Overstock and other places. Just search for “Personal Alarms”. You can use them “as is” or you can adapt them. I adapted one for a screen door alarm. I took the alarm, removed the long rope, added some loop key rings, and some double stick tape on the back. Things to think about. If you live in a cold area of the country you may need to periodically test it (batteries run down in cold environments) and make sure you use good strong double sided tape!